I've mentioned it before, but I love being a part of surprises. Whether leaving an Easter basket on a friend's doorstep or sending a card to a distant relative out of the blue, there's just something about knowing you're going to make someone's eyes light up that warms my heart. Even better? When the recipients are kids, as children can't hide the joy and excitement from their faces, even if they wanted to. Which is why I was thrilled when everything came together to help celebrate Auntie Anne's 25th Birthday with a Pretzel Party in a room filled with 5- and 6-year olds! Another year older and wiser, Auntie Anne's has spent 25 years creating pretzels that are known as "better than the best you've ever tasted." With flavors already including Original, Cinnamon Sugar, Almond, Sour Cream and Onion, and more (along with Stix, the Pretzel Dog and Pretzel Nuggets), what better way to celebrate this milestone than by adding a new one to the lineup? 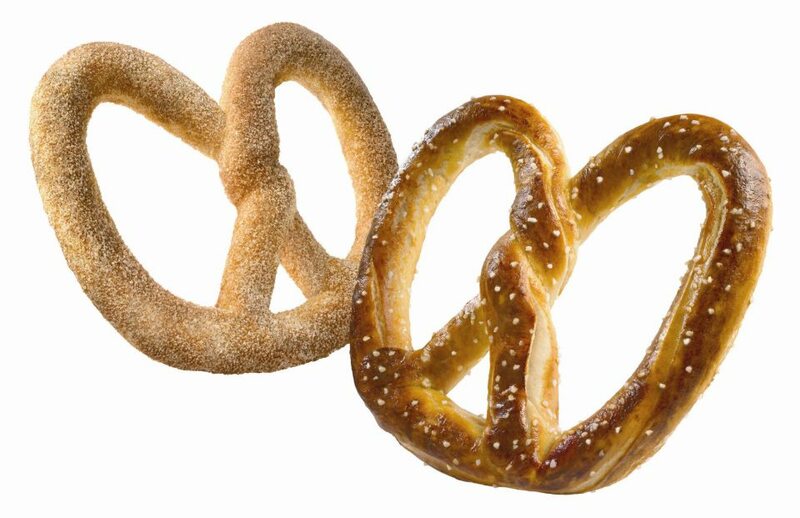 Which is just what this pretzel perfect company has done with the introduction of their newest hand-rolled soft pretzel, Honey Whole Grain, to its variety of gourmet freshly-baked favorites. This tasty new addition is made with real whole grain dough and boasts one daily serving of whole grains, giving it more fiber, protein and iron than many other snack options. At 300 calories or less, this better-for-you pretzel feels responsible, but tastes reckless! Excited to try out the new Honey Whole Grain pretzel while surprising Big Sister E's Kindergarten class, Little Sister B and I headed to Auntie Anne's to pick up our party supplies. 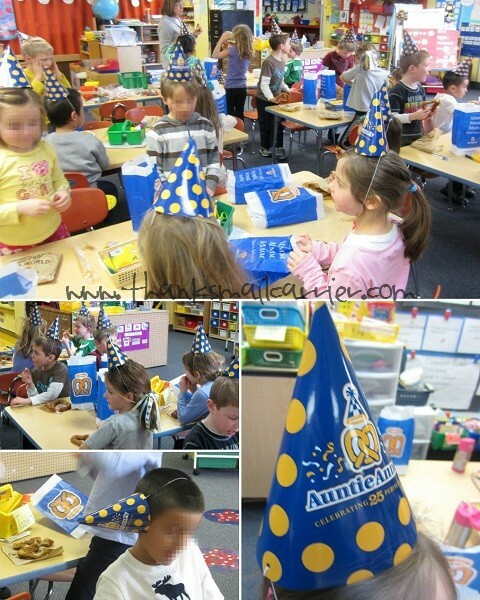 Little did I know that Auntie Anne's would have a surprise for me as well, as they had not only baked 25 fresh Honey Whole Grain pretzels for us, but they had them individually bagged and ready to go for each child — including fun party favors like a hat, twisty straw, cute tattoos and a coupon to head back for another pretzel! We have always been fans of our local Auntie Anne's (Madison folks, next time you are at West Towne Mall, GET A PRETZEL!) but they truly went above and beyond in helping us prepare for our party and made me love them even more! All that was left to do was head over to Big Sister E's school (which was more difficult than it sounds, as driving in a car filled with the amazing aroma of Auntie Anne's pretzels was a hard test for my willpower — made even harder by Little Sister B's continued comments of Mmmm, it smells so good in here and Mama, I want to eat those pretzels right now!) to await the class' reaction. Many of the kids recognized the Auntie Anne's logo on the bags right away, while the rest took one peek inside and squealed with joy. Instead of their usual crackers for afternoon snack, they found something much more delicious! 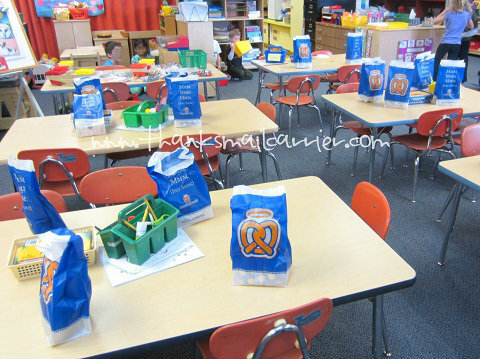 Within moments the class had put on their party hats and dug right in to their pretzels with glee. I sure don't remember having this much fun in Kindergarten! 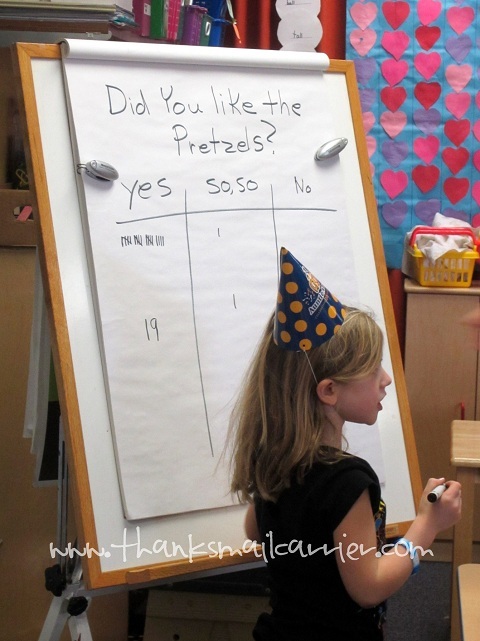 While the mmmms and yummmms made it pretty clear that the Honey Whole Grain pretzels were a hit, Big Sister E's teacher added a little educational fun to the party by taking a poll on the class' thoughts. The single "so, so" vote ironically came from Big Sister E... who then turned to me and asked what "so, so" meant because she really liked the pretzel. Apparently my child needs to pay a little closer attention to the voting lessons. I'd say that the votes show that this was definitely a successful party! Little Sister B and I had our own special after-party celebration as well, as when we returned home from the school visit, we sampled Auntie Anne's amazing Cinnamon Sugar pretzel, thanks to our local store's generosity of having sent along a bag containing a few other pretzel varieties. I don't know how it is possible that I have never tried this incredible flavor before, but it will definitely be happening again! 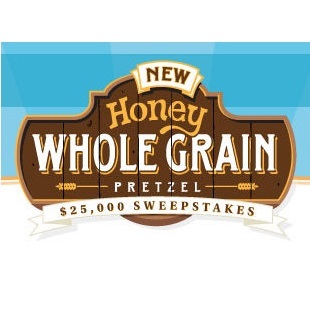 Every year Auntie Anne's rolls more than 97 million pretzels at their 1,330+ locations all over the world, so if you haven't stopped by lately, you are missing out (you'll especially want to join them on March 9th for Sampling Saturday to get a free bite-sized sample of the new Honey Whole Grain pretzel)! 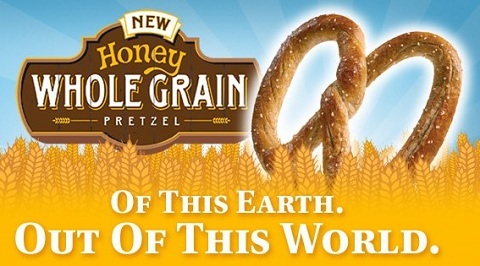 We have yet to try one of their fantastic pretzels that we haven't loved and the new Honey Whole Grain is no exception. I have no doubt that we'll be ready to celebrate the next 25 years of tasty pretzel goodness with Auntie Anne's as well! If you want to be a part of the fun even further, you can also twist with Auntie Anne's online for a chance to win $25,000! Plus, you could instantly win an Apple iPad mini, Coca-Cola beverages for a year, or a $25 Visa gift card... just visit PretzelPerfect.com from now until March 31st to join the party. 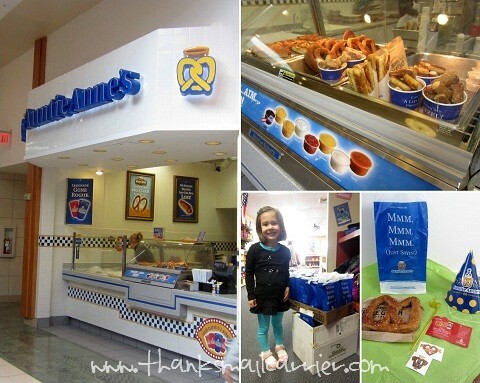 One lucky person will win 25 free Pretzel cards (valued at $3/ea) from Auntie Anne's! A big thank you to Auntie Anne's for providing a party pack of supplies for me along with 25 coupons for pretzels as well as coupons for one lucky giveaway winner. An extra thank you to our local Auntie Anne's for being so thoughtful and going above and beyond in preparing our party bags and extras. The opinions shared are my own and honest and if you really need to see more, click here to see how I roll. I love the Cinnamon Sugar! I would like to try the Honey Whole Grain. Cinnamon Sugar is my favorite flavor! My favorite is the Jalapeno with the Cinnamon Sugar Nuggets a close second. My favorite is The Original! 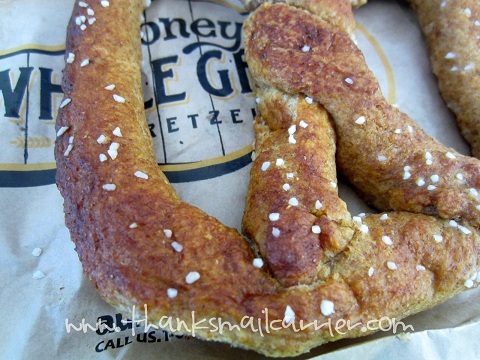 I am a big fan of their original pretzel with salt and hubby loves the cinnamon & sugar. i like their original pretzel with salt and cheese dip! We like the original, the cinnamon sugar, and the whole wheat. I love the sugar cinnamon pretzels. They are addicting. I really love their Original Pretzel! My favorite is almond - especially with the caramel dip! I like the Original Pretzel with mustard. Almond pretzel with caramel sauce. I like the pepperoni pretzels. My favorite is the Original. It's so buttery and yum! I love the cinnamon sugar pretzels with their cream cheese dip :). Cinnamon sugar is my favorite. the jalepeno is my favorite! My favorite is the original with salt. Auntie Anne's Cinnamon Sugar pretzel is my favorite. I used to love the Jalapeno, but apparently they don't make them anymore. My second favorite is the sesame though, with almond being right up there. I typically get a regular pretzel & on occasion I'll get some cheese sauce to go with it. So that's my current favorite variety, although the cinnamon sugar does sound like it's pretty darn good too! I'll def have to give it a try some time soon!! Cinn Sugar is mine but my son can't wait when we head to the mall to snag a pepperoni pretzel! Cinnamon Sugar would be my favorite! I like the almond pretzel. I love the their pretzel sticks and cream cheese dip! 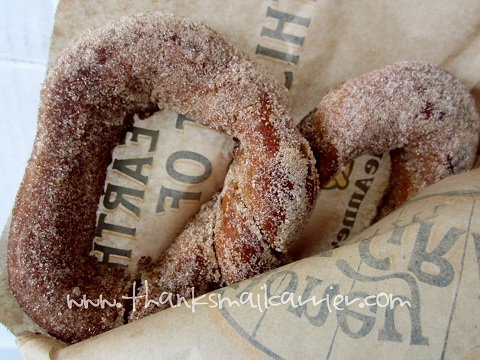 I love the cinnamon sugar, especially with the little pretzel pieces because the whole pretzel is so messy. I like Jalapeno the most. I love the original with cheese sauce and marinara. I love their original pretzels! I'm all about the cinnamon and sugar. Cinnamon and sugar of coarse. yum, now i'm craving them ! Original with cheese dipping sauce! I want to try the almond one! Definately sour cream and onion. Cinnomaon Sugar is my favorite. Love Auntie Annie. Always entices by a warm pretzel! Cinnamon sugar is the best! I have never tried them but would love to try the pepperoni & cinnamon sugar the most..thank you! Original with salt is my favorite! Pepperoni, Garlic, & Cinnamon Sugar sound good to me! I love the original without butter dipped in their Hershey chocolate dip! I haven't tried them but Cinnamon Sugar sounds good or maybe Raisin. Love their garlic pretzel :)! I like the cinnamon sugar pretzels. I love Sour Cream & Onion! my favorite is Cinnamon Sugar! I love pretzels, but live in a smaller city, and there is no Aunt Annie's, so I haven't tried theirs. The cinnamon one looks delicious! I am currently living in a big city while my nephew is in the hospital, and Aunt Annie's are all over the place! Original - Un salted with the cheese dip. Yum! Cinnamon Sugar is my favorite! Thanks for the chance to win. the pepperoni pretzel is my favorite! An original with sweet mustard dip! i like the one with cinnamon sugar. Original, I love their pretzels so much! I must be BORING but I really like the basic normal, pretzel with the butter and salt. I like the original w/ no salt and cheese dip! Plain without salt, dipped in cream cheese! My absolute favorite is the cinnamon sugar. I like the pretzel dogs. I like the honey whole grain pretzel.